Yesterday was a strange day. When I went to bed on Saturday night, I was very pleased after watching some badgers at a local sett, wondering what I’d get on my trail camera and curious into what the result of the vote in Malta about spring hunting would be. For some reason it seemed obvious to me that they’d vote ‘NO’ for many different reasons. For example the terrible consequences it has on the decline of many birds, whether it’s in Malta or wherever the bird is migrating to, the other wildlife affected, the fact that forests have been wiped out or maybe the fact that Malta seems to be referred to as the place with this disgusting slaughter of birds. The list of reasons voting ‘NO’ is endless. I was up nice and early yesterday morning to collect my camera, eager to see what I had filmed and wandering if the cubs had appeared yet. I was very pleased with the footage. Unfortunately no cubs just yet but they shouldn’t be long now. After looking through all my footage I refused to get ready to go out before I found out the result of the vote for the spring hunting in Malta. I sat patiently at my laptop screen. Refreshing every minute or so on Twitter and reading through all the articles that were published. It was very tense as I think, along with many others, that ending the slaughter of birds in Malta is essential. Malta is a small island in the middle of the Mediterranean Sea. It is the natural place for exhausted birds to rest as they make their long migrations between Africa and Europe. These birds are an easy target for the 10,000 bird hunters that occupy the countryside of Malta and each year countless birds are shot out of the sky in spring and autumn. Spring hunting is especially damaging to wild birds because these are the birds which have survived the winter in Africa and are flying back to Europe to nest and provide the next generation of birds. The spring hunting of quail and turtle dove is an activity which is banned across Europe but still remains in Malta. According to the hunter’s own report, 4,131 turtle dove and 637 quail were shot during the spring season of 2014. The turtle dove has become increasingly rare following rapid population declines. The species is now included on the Red List of conservation concern meaning there are concerns that the species could become extinct in the UK within a decade. That’s just in the UK. There has been a 70% decline of these birds since the 1970s. One of the reasons because of this is due to hunting. They also hunt the birds during the Autumn but this doesn’t have as much impact as during the spring as then they are travelling to breed. Hunting these birds on their way to breeding grounds results in not only one bird dying but their offspring too. Furthermore, a bird will reproduce every year, say for at least five years and hence the number of unborn chicks is multiplied. This results in the destruction of a whole generation. For example, if 4,131 birds were shot dead last Spring alone. So, say each bird raised five young over five years, excluding the fact the birds will be male and female and turtle doves also have problems with breeding due to habitat and food loss, that’s 20,655 unborn chicks over five years just from the birds shot in the 2014 spring hunting season. It is estimated that only 14,000 pairs breed in the UK every year. Now if you compare them figures it’s pretty obvious that the Spring hunting is having a massive impact on the decline of turtle doves, not just in the UK but for the species as a whole. Then when the birds are travelling back for the Winter, away from Europe, the birds that did survive and their offspring could be shot anyway. They have no chance. But turtle doves aren’t the only species that’s suffering. As I stated before, the spring hunting is targeted at turtle doves and quail. Common quail are also in decline. But, as well as shooting these birds, many Maltese hunters also use the spring hunting as an opportunity to target rare and protected species of birds that breed in Europe, such as Pallid Harriers, Cuckoos and Bee-eaters. The hunters like to pretend that the problems with shooting birds is only affecting Malta but this isn’t the case. Many of the birds targeted by hunters are the subject of big international conservation projects to increase their numbers where they breed. 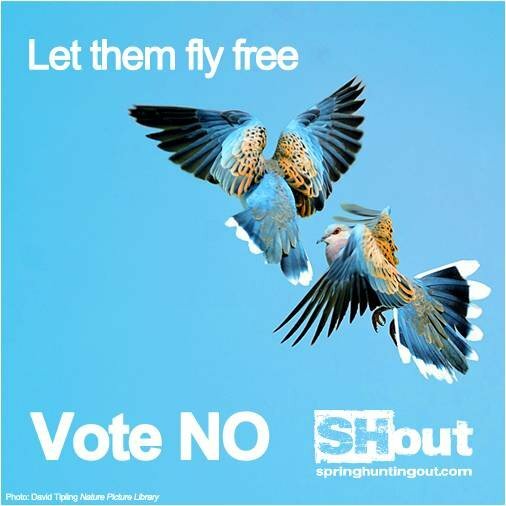 Other bird species are in fact not breeding in Malta simply because they are either being killed or because they are scared away by the continuous shooting. Along with this, sound pollution also disturbs other animal species that breed in the spring. I hope you can see that the spring slaughter of thousands of migrating birds is disgusting. How hunters can go out and shoot down migrating birds, which don’t even belong to Malta, and get pleasure from that along with knowing that not only turtle doves and quail are in rapid decline but so are many of the other birds they shoot which fly over. If this doesn’t stop then we will see birds becoming extinct. Malta made the wrong decision yesterday morning. The spring hunting will go on. The persecution of birds which are becoming missing from European countries will continue. For me, along with many others, this was terrible news. The hunters really have no idea. When will they realise what they are doing and stop. I hope that this happens before it becomes too late. I’ve never seen a turtle dove yet the hunters in Malta may see a flock go over during the spring hunting season and shoot them all dead with no guilt or understanding whatsoever. However it isn’t all bad news. People in Malta do want this slaughter to end. The margin of victory was tiny – 50.44% to 49.56%. This isn’t the end though. Fantastic charities and organisations made this referendum happen and they won’t give up. They’ve got this far and we won’t give up either. Two of these charities are SHout and BirdLife Malta. Join BirdLife Malta and support their work for birds and nature in the Maltese Islands. Whilst on Twitter and reading the articles about the referendum in Malta yesterday morning it was fantastic to see so much support, especially from fellow young people. However I did see some comments about boycotting Malta. I don’t think boycotting Malta is the answer. Yes we are angry, so am I but we need to use our anger wisely and turn it into a positive energy. As you can see a lot of people in Malta are against the spring hunting and they have some fantastic charities against it too. It doesn’t help that the Government in Malta are pro the hunting. I think the best option is to work with them and help where we can. By making ourselves heard, shouting above the noise and not giving up, we will win. It’s shocking the kind of lengths people will go to take down such beautiful birds. I found the information in this blog really helpful and a new charity has come up on my radar. Thanks for making me aware of Birdlife Malta Georgia.